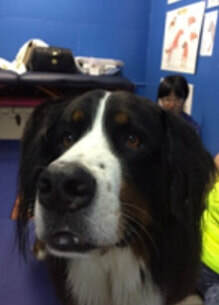 "It was just three days after Thanksgiving last year - that morning, we had just come home from our usual morning walk at the beach when I noticed that Shintaro, our 4 year old Bernese Mountain Dog , who had been laying around by the front door resting started having problems. I noticed that he had his front paw buckled and seemed to be having some kind of problem with it. There was no sign of an obvious injury, but he still seemed unable to put his paw down so we decided to take him to the vet right away. At that point, he was limping but was still able to get down the front steps of the house and jump in the car. By the time we got to the vet about 20 minutes later though, he could not get himself out of the car, and we realized he was not even able to stand on his own - it was an extremely frightening moment. Not having any idea what suddenly happened to our boy, the next several hours we spent waiting for the results of the tests and MRI were just gruesome. The MRI revealed that he had been struck with an FCE (fibrocartilaginous embolism), which is an embolism that can occur in the spine, that left his left side of the body temporarily paralyzed. For the first 4 or 5 days, he could not even sit up, all he could do was to lay down or be in the lay position. With the support of a special harness, we would literally pick him up and take him outside and had him in standing position to express his urine. Expressing urine from the bladder of a dog this size was not an easy task. In one week we had to take him back to the vet a couple of times to have the technicians express it for him because we could not get him to urinate for more than 24 hours. The neurologist at the San Francisco Veterinary Specialists who diagnosed Shintaro’s FCE, recommended that we immediately contact Dr Ilana at A Well Adjusted Pet, that it was crucial to get him started on physical therapy right away. Within a week of getting him out of the hospital, we were able to get an appointment with Dr Ilana, and thus began our journey of PT for our boy which will be lifelong. At our initial meeting, Shintaro was still unable to stand on his own, but again with the help of the harness, the doctor put him on a giant inflatable peanut and showed us exercises that we could also continue at home. She also had him walk on the water treadmill - all exercises to help him regain his muscle strength and memory. After about 10 days since the initial collapse, Shintaro was able to stand on his own and even with his left side still very weak and dragging, he was able to walk again. From that point on, the recovery sped up quite a bit, and with the use of a special boot (OrthoPets Toe Up) on his hind leg that keeps his toes up and helps with the movement to lift his leg up instead of dragging it, he very quickly regained a lot of his faculties - going up and down the stairs, running with his friends, jumping into the car, etc, now he is able to do practically everything he was able to do prior to the stroke. Today, the weakness in his left side still remains, he does stand with a lot of his weight on the right side, his left front paw would often buckle and the hind leg drags a tiny bit; but we will continue to work with Dr Ilana and also with his swimming PT and with the acupuncture sessions with Dr Ella, to keep him upright and happy for many more years to come!"